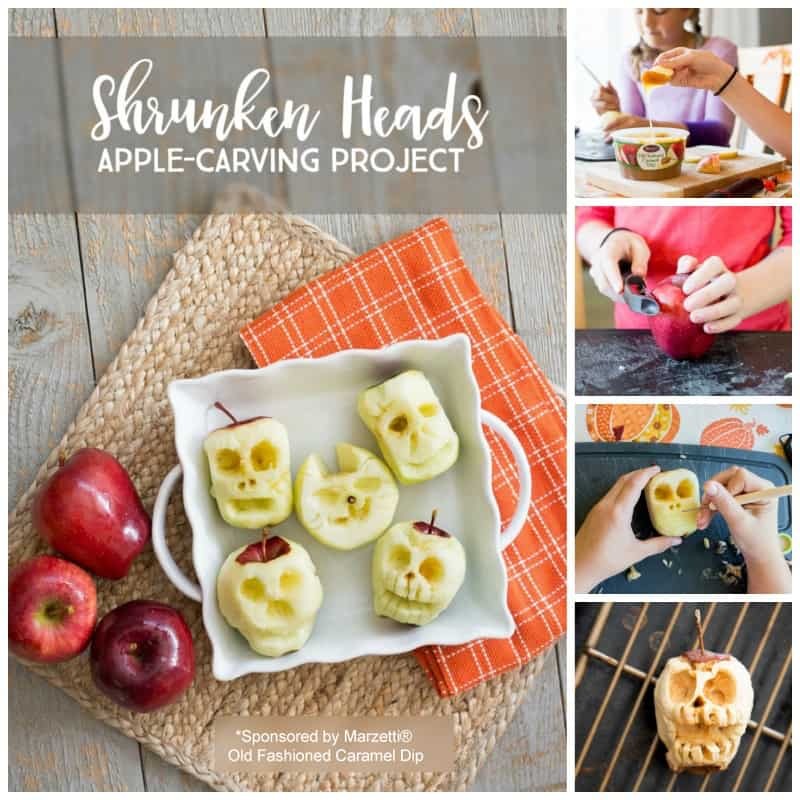 Learn how to carve apples and transform them into irresistibly spooky shrunken heads (right before your eyes) with this DIY Halloween project for tweens. This fun fall project is sponsored by Marzetti. The air is crisp and fall has officially arrived. I’m so excited to celebrate the autumn season with my family, but holiday traditions with tweens can be a delicate balance. They’re at a point where they’ve outgrown most kids’ Halloween crafts on Pinterest, yet they’re still excited to CREATE. 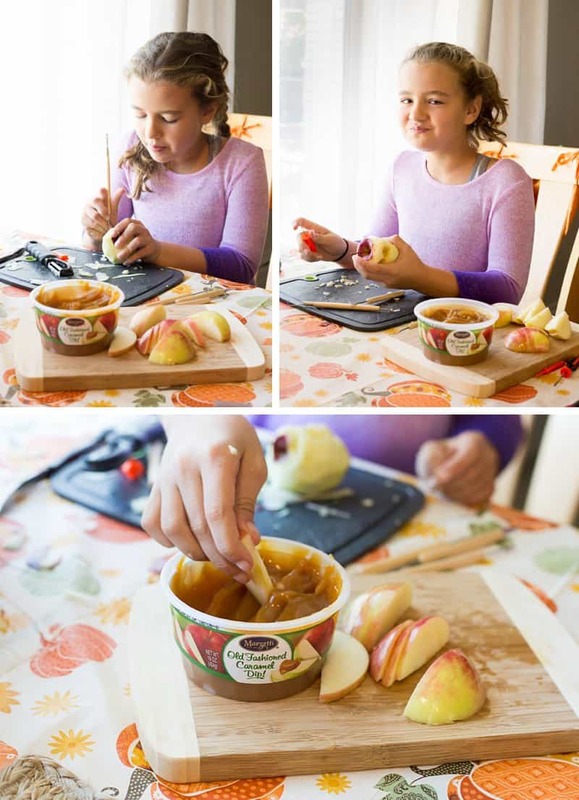 Has your tween outgrown some of your favorite autumn traditions, too? You’re going to love this project—and some of the unexpected perks that come with it! SAFETY NOTE: Please use common sense when deciding what type of carving tools to use with your family. My tween girls (ages 10 and 12) attended a Montessori preschool where they were taught how to respectfully use a knife and other sharp tools at a very young age. For this project, we used a pumpkin-carving set and a wood-handled clay tool set from our local craft store. You know your child better than anyone else; use your best judgment. Get Carving.—See photo examples and a stop-motion video tutorial below! Fully Dry the Shrunken Heads. 1. Create the Magical Mixture. Grab the cauldron, lemon juice, and salt. 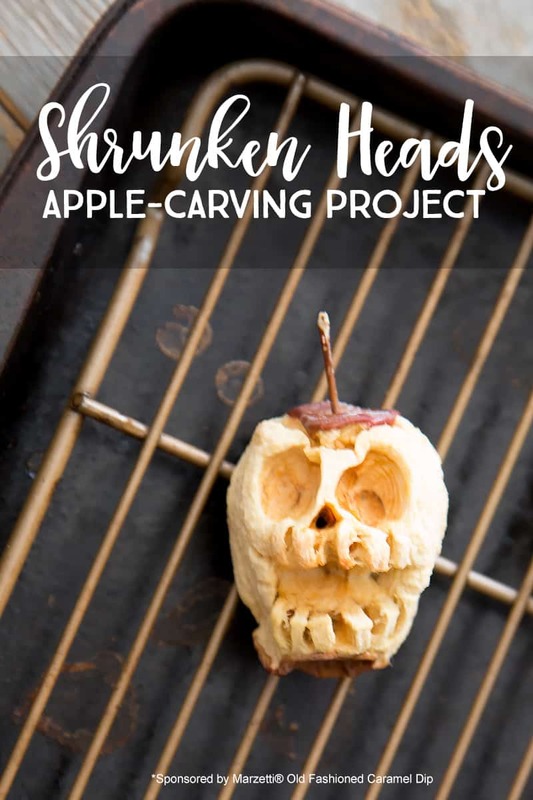 This combination of ingredients creates a Magical Mixture that will: (a) help stop your apples from immediately browning when carving and (b) later help preserve your shrunken heads. Soak your apples in the Magical Mixture for 1 hour before carving them. OK, OK… That’s the official recommendation. But we snacked on apple slices and caramel dip for about 15 minutes while our project apples soaked and then we couldn’t wait any longer. Our project apples did get a tad bit brown while carving, but I think they still turned out awesome. Grab an apple from the Magical Mixture, dry it off, and peel. 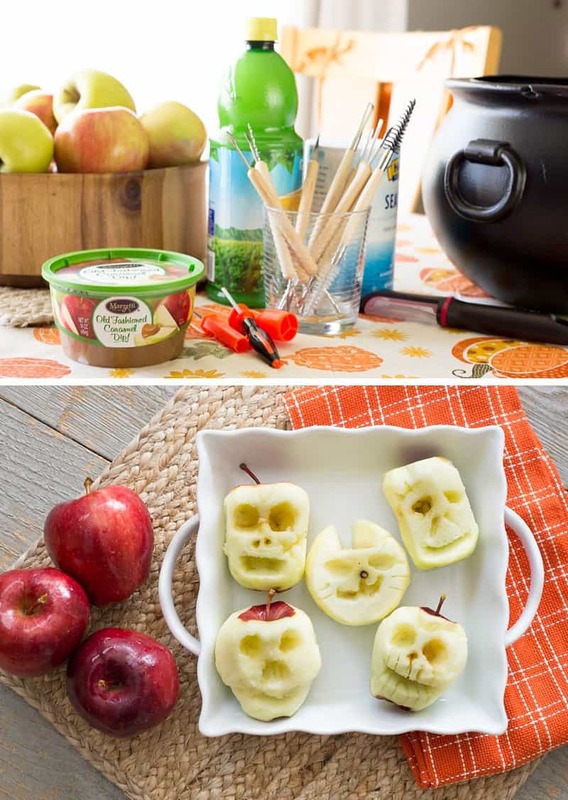 We decided to use Red Delicious apples for our project because of the natural skull shape of the apple. They’re also one of the cheapest bagged apples at the grocery store if you want to be cost-efficient. And my second daughter… Well, you’ll notice that most of her shrunken heads are smiling at you. 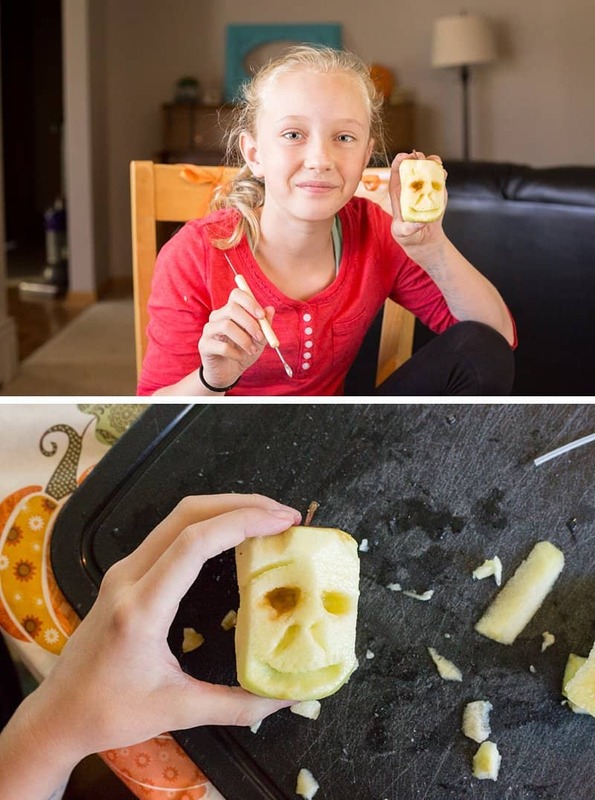 Would you like to see this skeleton apple carved from start to finish? 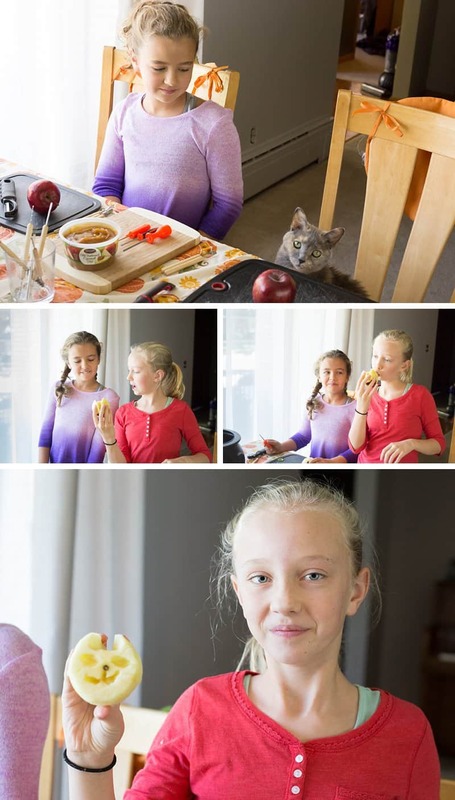 While we were carving apples, we even had a little feline inspiration. 4. Soak the Apple Heads. 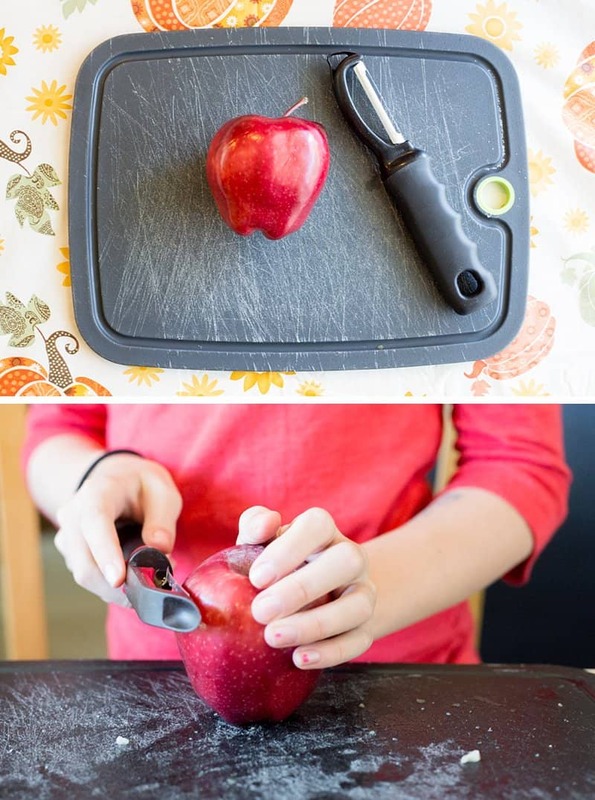 After you carve each apple, pop it back into the Magical Mixture. Let the apple carvings soak for about 60 minutes in the Magical Mixture. The apple faces tend to float up, so occasionally give them a stir to ensure the entire apple gets coverage so the faces get well coated in the mixture, too. 5. Fully Dry the Shrunken Heads. Air Dry—Place your apples on a cooling rack or hang them with twine to allow complete air circulation. To speed up the process, use a box fan to keep the air moving. The apples will dry within a couple of weeks, depending on the humidity. Ensure all moisture is removed by baking the apples at 200 degrees for 4 hours. Egyptian Mummification—In a large plastic bag, combine 1/2C salt and 1C baking soda. Toss your apple heads in and ensure they are coated in the mix. Leave your apples in the mixture for 1 week and watch as the salt and baking soda absorbs the moisture. Speed Dry—Place your apples on a cooling rack set on top of a cookie sheet to allow full air circulation. Set your oven to the lowest temperature option (200 degrees or less) and begin to dehydrate the apples. When you leave home (or go to bed for the evening), for safety reasons, turn off the oven. Check the progress through the oven window. Do not open the oven door! Your apples will continue to dehydrate in the warm oven, even if it is off. This dehydration approach takes approximately 24 hours depending on your drying schedule. 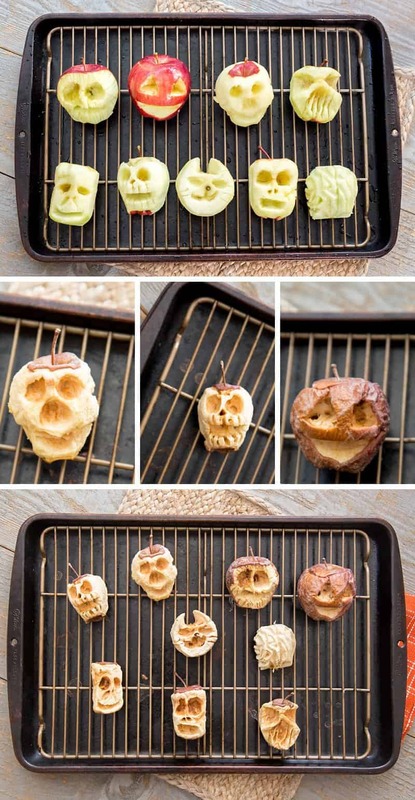 We were so excited to see the transformation, we chose to speed-dry them and popped our apple carvings into the oven. 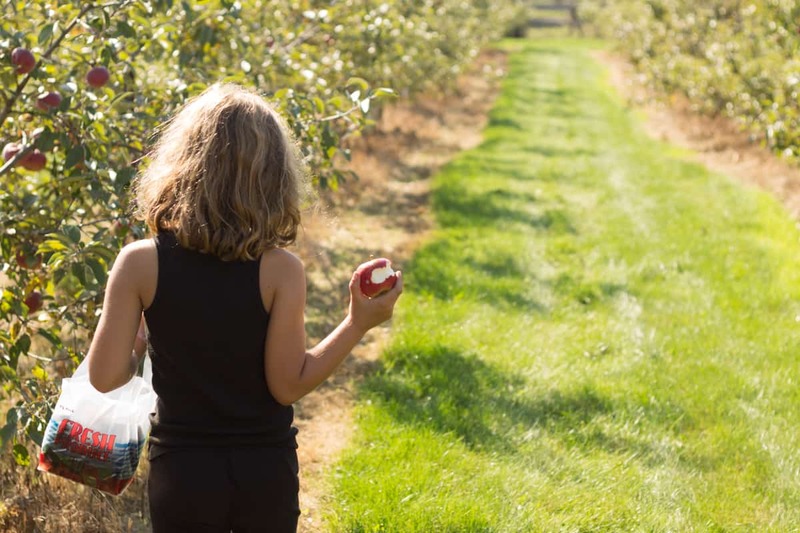 If you want to save your apples long-term (without them rotting or molding), ensure they are 100% dry and then spray or dip them in a polyurethane sealant. We’re going to skip this step. Honestly, I want to have an excuse to make these again next year! Shrunken heads are fun, but don’t be afraid to get creative. The apple carving below was inspired by a stress ball. 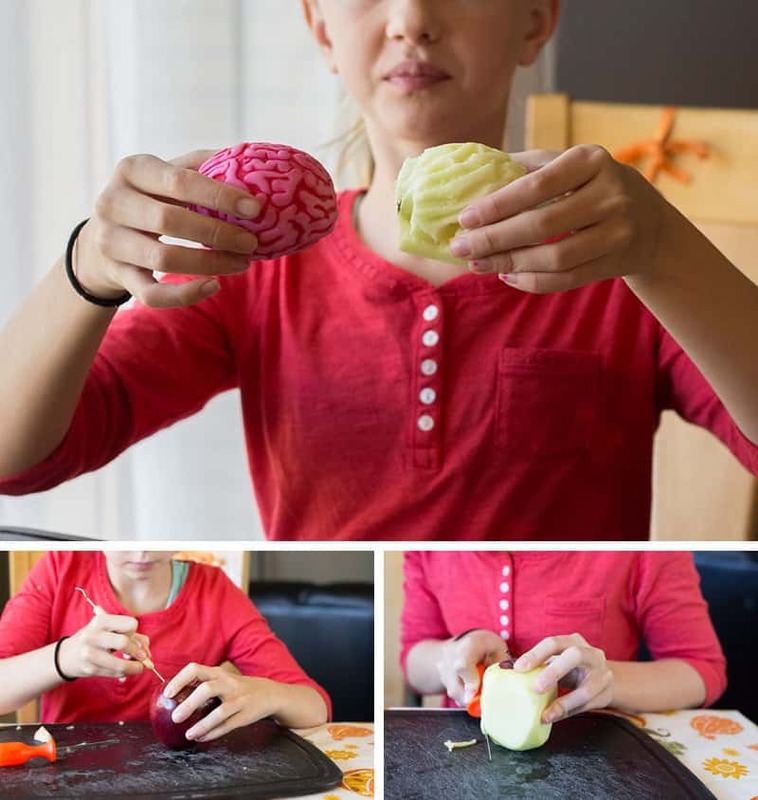 Watch a start-to-finish stop motion video and learn how to carve an apple and make a shrunken brain. 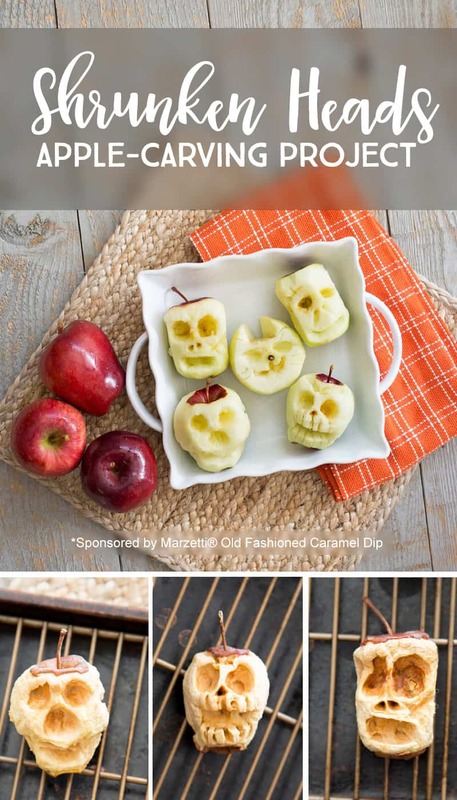 When I was a kid, carving apples was one of my absolute favorite art projects in school. For that reason, I was so excited to share this activity with my girls. However, the memories created by our trip to the orchard and this apple-carving project turned out to be so much more than I had imagined. I hope you will PIN THIS TUTORIAL and add this project to your autumn to-do list. P.S. I’m telling you, the Caramel Dip makes the project. It’s so thick and delicious. First I have to say this is sooo adorable and very doable!!! My favorite apple for dipping are Granny Smith – i love the tartness to be dipped in sweetness – mmmm! My favorite type of apple for dipping is Gala! I love Golden Delicious apples for everything. I like dipping Granny Smith apples. I like to dip with Gala apples. I like to dip Fujis. I love granny smith apples….delicious. I don’t like mushy apples. I love Granny Smith because they are the perfect balance of tart with sweet dipping caramel! I LOVE TO DIP GRANNY SMITH APPLES. My favorite apple for dipping is the Gala Apple! Thanks for an awesome giveaway! I love using Granny Smith Apples. I do believe this is the best thing I’ve ever seen! So very creative and fun! we really love gala apples! I love love LOVE jazz apples, So good!